The objective of the aftercare programme is to provide safe learning spaces in which children/youth are assisted with their academic progress and self-development in order to improve the academic and educational achievements. NWF offered two types of Aftercare programmes in the period of End of January to July 2013 one for children/youth from (Grade R to Grade 7, age group 5 to 13 years old) and one for children/youth from Grade 3 to Grade 10 (age group 9 to 16 years old). In total, 122 children and youth were registered and round about 95 children/youth attended the programme on a daily basis. The commitment of the children towards the programme was very high. A Life Skills Aftercare Manual was developed in 2013 as well. The Aftercare Programme at both schools started in the end of January 2013 and was running from Monday to Friday from 12.45pm – 5.30pm. In total 82 children/youth were registered. 65 children/youth attending the programme at Zerilda Park and 17 children/youth at Levana Primary. The programmes were supervised by staff members, part time staff members and of New World Foundation with the assistance of 5 women of the communities of Lavender Hill/Seawinds. The programme has a set structure. Children/youth are receiving lunch, having a resting period, getting home work support and afterwards have a period were different life skills and educational programmes are offered, such as arts and craft and painting, sewing and beading, board games, reading and numeracy activities. The life skills focused on getting to know who I am, the importance of a positive self-esteems, family and healthy life style. Several outings were organised. In addition, two parents meetings took place, which were well attended. The focus was on the importance for support and responsibilities of parents for children/youth. Two of the facilitators participated in a parenting facilitator training. They have organised the first parenting training in July, which was attended by 8 parents. The Aftercare Programme started in the end of January and ran daily from Monday to Thursday from 2pm – 5.30pm. Up to 44 children/youth were registered. Approximately 33 children/youth attended on a daily basis. Some children/youth received additional support programmes from a trained clinical psychologist and its team of “Journey Back to You” to assist them with their behavioural problems and trauma counselling. The uniqueness of the programme is the monitoring of the behaviour and academic progress by one staff member of NWF in cooperation with the teachers and principals of the schools, to ensure the progress of the children/youth at risk. Teachers/principals of Primary and High schools referred most of the participants. The programme was facilitated by a NWF youth worker with support and in cooperation with women of the Aftercare Programme. International volunteers and local volunteers provided additional support. The programme offered every participant lunch, homework and academic support, as well as various life skills modules. Educational programmes such as literacy and numeracy activities, arts and craft, environmental education and games were part of the programme as well. Two meetings were conducted with parents with 13 parents and 18 parents attending respectively. The two meetings focused on the expectations of parents towards the programme and year planning and management of the behaviour of the children and youth, parenting skills and drug awareness. The parent involvement is vital and the NWF youth facilitator encouraged the parents to be actively involved in their childrens life. One Holiday Programme (1 week in April 2013) for the Aftercare Children was organised and one Holiday Programme (2 weeks in July) for the whole community (children and youth in the ages of 7 – 16 years). The Holiday Programme offers the children and youth a safe environment during the holiday time. The focus is usually to offer the participants a programme based on arts and cultural activities, sport activities, games and fun activities, life skills and outings. 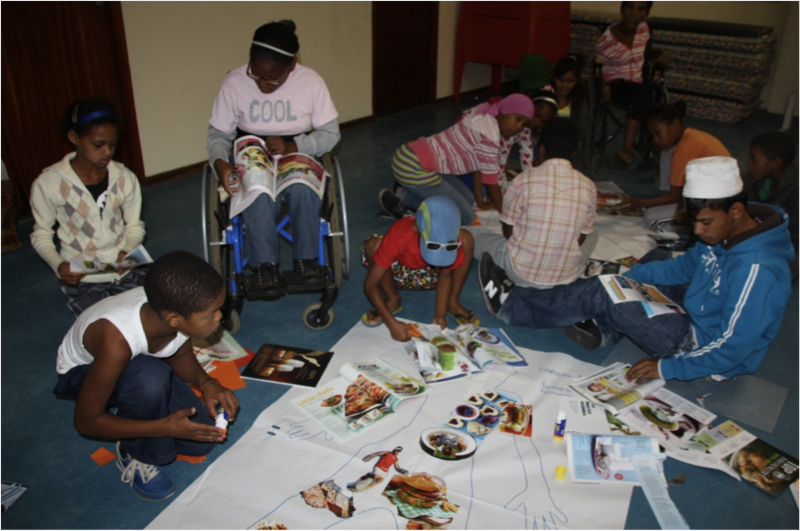 The April Holiday Programme was organised at NWF for the children/youth of the Aftercare together with the Chaeli Campaign, which works with children/youth with disabilities. These youth are facing the challenge of being excluded from the daily community life. A series of workshops for all the participants was organised to sensitize children and youth without disabilities and integrate children/youth with disabilities. NWF was grateful for the chance to cooperate with the Chaeli Campaign. The Programme was conducted from Tuesday, 02 of April to Friday the 05th of April from 9am – 3pm and in average 30 -35 children attended the programme. Unfortunately, the programme was restricted due to gang fights and shooting in the area, which required additional safety measures. Children and youth had to be picked up and dropped off at home. The June/July Holiday Programme was organised for the children/youth from the whole Lavender Hill community at the Hillwood Primary School with the support of the Department of Social Development. The programme started with a training for youth volunteers from the 24 until 28 of June. The Holiday programme ran from the 1st until the 14th of July. Over 320 children and youth participated in the programme with a daily average attendance of 160 children and youth. The children and youth were divided into three different age groups (6-9 years), (10-12 years) and (13-16 years). The programme consisted of various life skills workshops, arts and craft workshops, games and sport programmes, environmental programmes and a daily meal. The Programme finished of with a talent show and presentation on the last day at the Uniting Reformed Church/New World Foundation with almost 300 children youth and parents participating. The Aftercare for the older children/youth is on Friday divided into a Girls and a Boys Club with the aim to create time and safe space where young people can learn about gender specific topics but also have the chance to do activities together. The programmes offered were open to non-members of the Aftercare programme as well! The programme started in the end of January and was conducted every Friday from 1.30pm – 4pm. In the beginning of the year, 21 girls were registered and the number increased to 34 registered girls in the age of 12–16 years in the meanwhile. In average 26 girls participated on a regular basis in the programme. The sessions were facilitated and supervised by a staff member of NWF with the assistance of local and international volunteers. Topics covered by the programme were life skills such as the Self, sexuality, gender topics, drug awareness, peer pressure, etc. Outings were part of the programmes as well. Especially Boys in the age between 11 and 17 have the need to a have positive male role models and their own space and time to express themselves and learn and acquire life skills. The programme is conducted at the same time as the Girls Club (every Friday 1.30pm-4pm) at NWF. It is facilitated by a NWF staff member with the assistance of local and international male volunteers. The programme commenced in the end of January. 27 boys in the ages of 11–17 years were registered with the average attendance of 16 boys per session. Sessions on self-development, dealing with conflict and violence, alcohol and drug abuse, sexuality, etc. were conducted, in addition to sports games. Additionally outings to Rondevlei and Zeekovlei Nature Reserve were organised. Soccer, the beautiful game, and sport in general are a good medium to teach children not only soccer or technical skills related to the sports code, but also to teach and develop important life skills such as leadership, teambuilding and cohesion, conflict management, anger management, emotional intelligence in order to strengthen the resilience of the youth. In addition, refereeing skills are important and teaching participants how to control groups, respect one another, deal with conflicts in a non-violent way and essential communication skills. The objective is to teach Life skills by using soccer as a medium in a safe, peaceful environment. The programmes was facilitated by NWF Soccer and Life skills facilitators and local and international volunteers. The programme commenced in the beginning of February at 4 Primary Schools (Hillwood-, Levana- and Prince Georg Primary School in Lavender Hill and Sullivan Primary School in Steenberg) on a weekly basis. The attendance differed from school to school with an average of 23 children/youth participating per session per school. Content of the programme were various Life skills and soccer skills. In addition, tournaments were conducted as well. The focus in the first half of the year was on improving the self-esteem through improved soccer skills and teambuilding activities but also topics like HIV/Aids. The specific objective for this programme is to give children/youth the opportunity to express themselves in a creative way, to find ways to express their feelings by using art as a medium, but also help to heal wounds and trauma. Martha Cabrera, the Nicaraguan psychologist described and discovered the phenomenon of multiple wounded communities. Art and Art Therapy is one way to create an opportunity to space and place for healing. In 2012 NWF facilitators and volunteers of the community of Lavender Hill received training in Art Therapy by a professional Art Therapist for twelve months. The transferred and learned skills enabled NWF facilitators to conduct art/art therapy classes. The programme started in the beginning of February 2013 at Hillwood Primary School every Monday form 2.30-5pm. The programme started with 24 registered youth and is accommodating in the meanwhile over 40 youth. The participants receive a healthy lunch, followed by the art and craft and life skills session. Different tools, materials and method of art making are used on regular basis to teach children/youth a variety of different skills. The youth leadership programme enables youth to become active and positive change agent in communities. The main objective for this programme is to teach youth leadership and life skills in order to enable them to become positive role models and change agents in their communities. In addition, young people are empowered to assist with programmes for children/youth and become support structures and role models for them. A Computer Training Programme is complementing the Youth Leadership programme. In the first six month (February – July 2013), the programme was offered to learners (17 -18 years of age) from two High Schools in the Lavender Hill/Retreat/Steenberg area. 21 students from Sibelius High School and 19 students from Crestway High School registered for the programme. The Programme started in February and was offered twice a week (Youth Leadership class and Computer Class) for 12 weeks. The modules in the Life skills classes covered were: The self/self concept and self management, communication skills, time management, prioritising and planning and topics such as good Leadership and role modelling and community involvement. In the Computer Training basic skills about the utilisation of Microsoft Word were taught and the participants were able to write their own CV at the end of the course. Ten outstanding and very committed youth leaders from both programmes were nominated to join the Ashley Kriel Youth Leadership programme of the Institute for Justice and Reconciliation and were additionally trained in reconciliation and reconstruction work and even invited to lectures at the University of the Western Cape. 15 youth leaders started to organise the Holiday Club meetings in order to run a Holiday Programme in June/July 2013 at Crestway High School. Over 17 meetings took place amongst the youth to organise with the assistance of Zain Nazier (Youth Leadership Programme Facilitator of NWF) the first Holiday Programme ever held at Crestway High School. The principal and the Department of Education appreciated the effort and extended their gratitude to New World Foundation. The programme was attended by 50 to 60 learners every day (24th of June -14 of July 2013). A Theatre and Drama group was started by some of the youth leaders, with the help of Zain Nazier, which the youth called !productions. The aim of this initiative is to offer young people a programme about arts and culture where they experiment in the field of arts and culture. It teaches furthermore skills to plan and produce shows and get the participants in contact with professionals in the field of arts and culture. In addition, the theatre/drama group aims to bring educational productions and theatre for development for children and youth as well. The group meets on Wednesdays in the evening from 6pm-8.30pm at NWF. The youth leaders facilitate the programme with the assistance of NWF staff members. The group started with 15 members and grew up to 23 registered members in the age group of 13 – 22 years old. The group worked on various small productions/stories related to the problems of the youth in their communities. Links and visits/outings for the group are part of the programme. Theatres such as the Masque Theatre, the Baxter Theatre and Artscape offered their assistance. In 2012 a Hiking Club was started by a group of young community members with the help of Bruce Adams (ex NWF staff member). It’s activities are now organised by two youth leaders of the NWF’s Youth Leadership programme in cooperation with a member of the Western Province Mountain Club and NWF staff members. The club is offering the youth an opportunity to learn about leadership in nature, to learn about the environment, survival and safety and first aid skills, group dynamics, orientation (reading maps, using a compass) etc. and the beautiful experiences to be in nature with a group and to support each other. The group is meeting on a regular basis on Tuesday at NWF from 5.30 to 7pm two times in a month to learn about the different skills, to plan hikes, prepare for outdoor trainings (two times a year) etc. The Club started with 10 members and in the last six month another 8 members joined the Club. 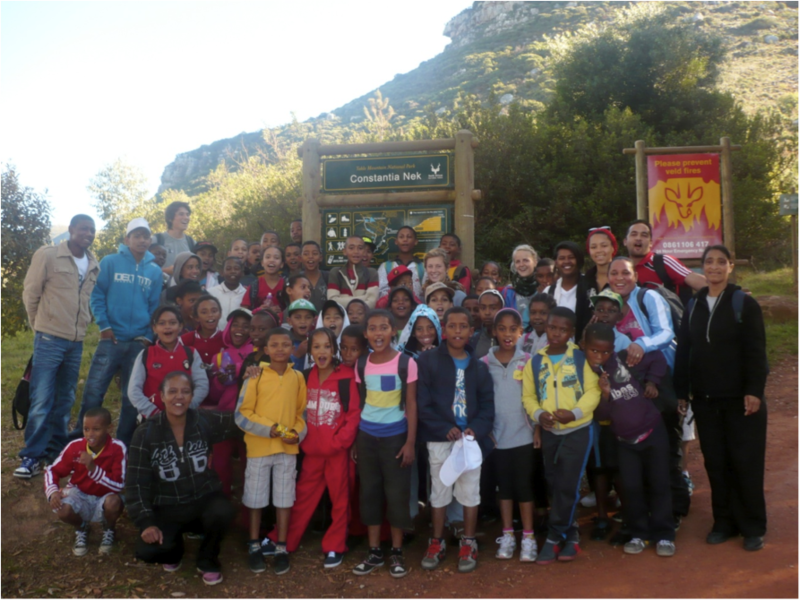 Three hikes and one training camp on Table Mountain were organised.